Some of you have asked me how large I suspect the giant pumpkin to become. This is the first year that I have grown this variety so at this point it is a guess game. But a guessing game that is fun to watch. I posted the below picture 2 days ago. It was taken Sunday evening at dusk. You will notice a red outline on the pumpkin. This is the outline of the basket ball to help with comparison. Yes, I could have photoshopped the edge that was cut off to create a perfect circle. Time is of the essence here. So right about the same size. Now the below picture was taken this morning (Tuesday) at dawn, 6:57 to be exact. Notice the red line?!? I can't believe how fast these pumpkins grow!!! From what I am told, the pumpkins can gain around 5 lbs a day with proper watering. I make sure I water the plant well and not just at the base but all along the vine. We had to move it as it was taking over our yard and we found that the vine creates a root system its entire length. Learn something new every day. The color is so pretty, I love watching them develop! I've never grown a giant pumpkin before. I wonder how many pies, bread, cookies, etc. you could make from that?? Do you have any great plans for it? Lori you pretty much covered it. LOL. Erin have you grown these before? Are there any tricks to the trade that I should know about to help it along? I haven't had much luck with pumpkins here, I'm not good at pollinating them and don't have enough space to plant enough to pollinate themselves! That is some pumpkin patch you have there! Is is just one pumpkin plant, or multiple? 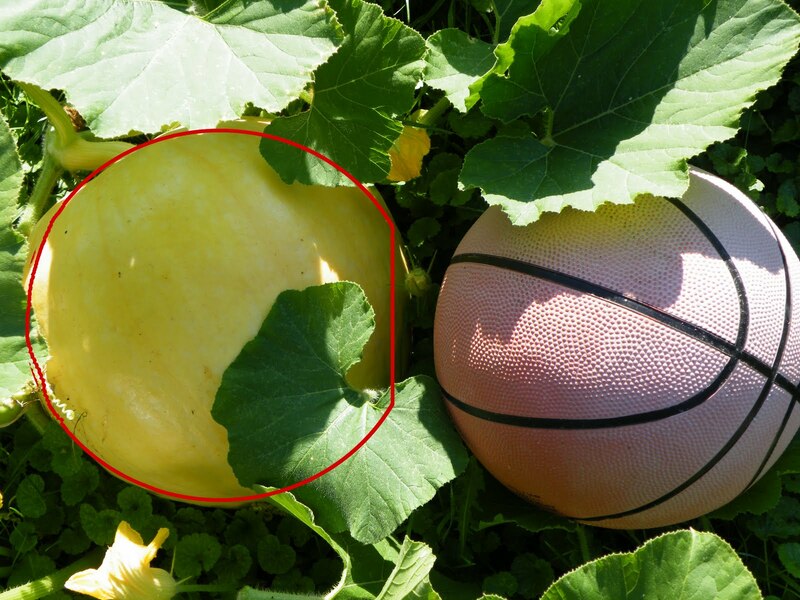 Do you have more than one pumpkin growing on your vine(s)? My pumpkins and squash try to snake across the lawn like that, but I have to keep them close to the fence or dh will mow them over with the lawnmower. We have a deal that I have to have edging or bricks around things or I can't be upset if something happens to them! lol! I can't wait to see how big they get! @thyme2garden, I believe the bulk of that area is 2 plants. 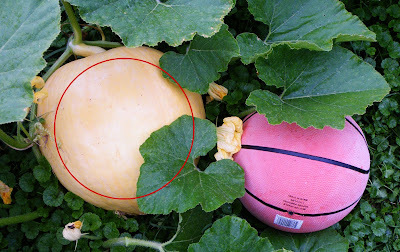 Behind it is another single pumpkin plant, a smaller variety but a yard snatcher as well. @GardenMom, I have my 11 year old lawn mower trained. He knows the pumpkins come first, creeping charlie second. LOL. He will mow around anything that is in the garden or face the rath of his mother. JK, he is just very careful. I took another picture this morning so when I have time, I will compare yesterdays pic. This is kind of fun to watch it grow! Are these edible pumpkins? I wonder how they taste! @meemsnyc, from what I understand they are but the flavor is very mild. I am fairly happy that it wont get any larger than 120-150 lbs if it grows like it should. @thyme2garden, that is a very good question. I may have to call in the movers (aka, my husband and neighbor). Otherwise, we will roll it or cut it in its place.